I can hear some of you snickering already. That Brandie and her poke cakes again! Yes, I know. I cain’t help mahself. They are just so much fun to make and so easy, so why not? I wanted to post something special for Easter and I definitely wanted do something with carrot cake. 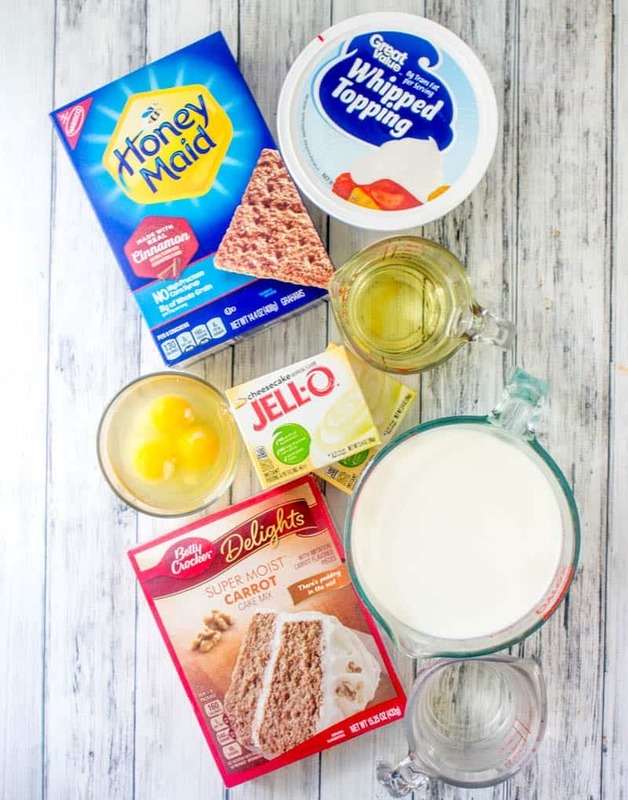 A boxed mix carrot cake is baked according to the package directions then holes are poked and a delicious pudding is added on top and will make its way into the holes. 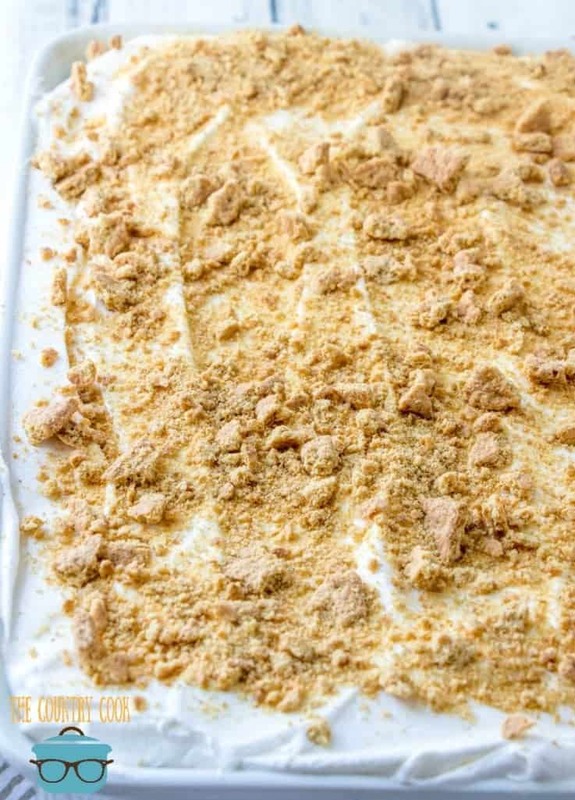 Then it’s all topped with a delicious whipped topping and crushed graham crackers. This takes carrot cake to the next level! Prepare cake mix according to package directions for a 9×13 cake. Once cake comes out of the oven, allow it to cool for just a couple of minutes. Then, with a wooden spoon handle, a spatula handle, or some other similarly-sized object, begin poking holes in the cake. You want the holes to be BIG so that the pudding has plenty of room to get down in there. Be sure to poke right down to the bottom of the cake. 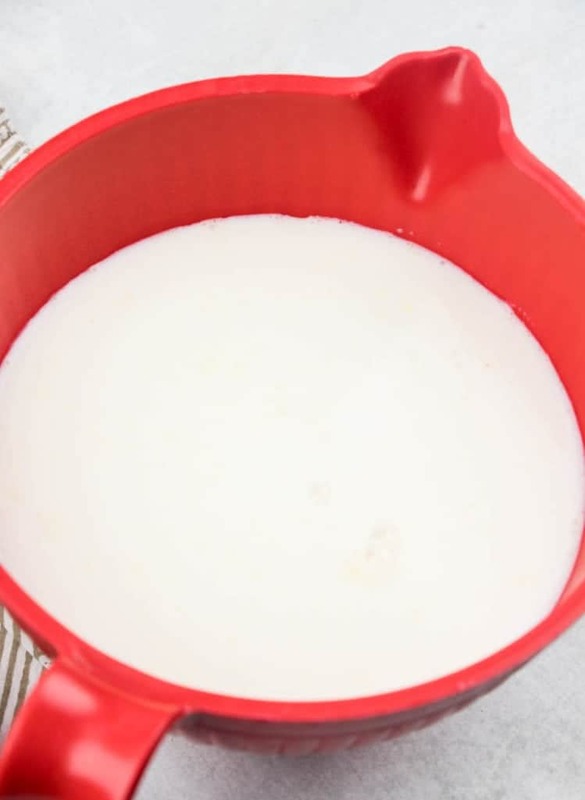 In a bowl, whisk together instant pudding mix with 4 cups milk. Stir until all the lumps are gone. Pour pudding over cake. Taking care to pour it right into the holes as much as possible. Spread it all out and using the back of the spoon, gently push pudding down into the holes. Put the cake into the fridge to set and cool (about 2 hours). Once your cake has completely cooled, spread on whipped topping. If you haven’t done so already, crush your cinnamon graham crackers. I just place mine in a ziploc bag and crush them with a rolling pin. Leave some of the pieces big. It’s nice to have a bit of a crunch when you eat the cake. 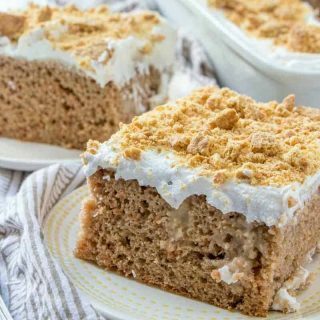 Sprinkle crushed graham crackers onto the top of the cake. You can do this part immediately before serving the cake if you like. This will ensure the crackers are crunchy when you serve it. And serve! Keep cake refrigerated. Cook’s Note: This cake gets even better the day after it is made. So it makes for a perfect cake to make the day before you actually need it. 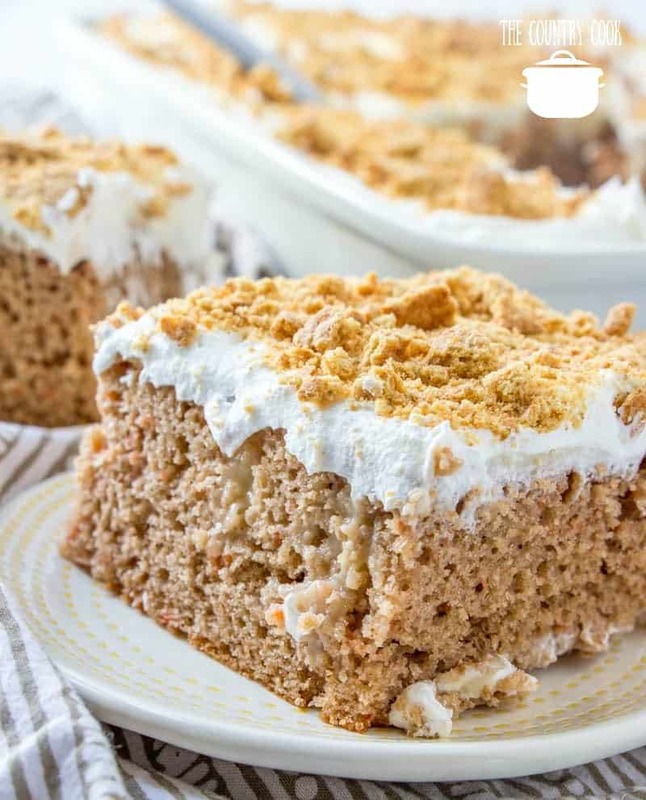 Carrot pudding poke cake is a carrot cake poked with vanilla pudding and topped with whipped cream and sprinkled with graham crackers. YUM! Prepare cake mix according to package directions for a 9 x 13 cake. 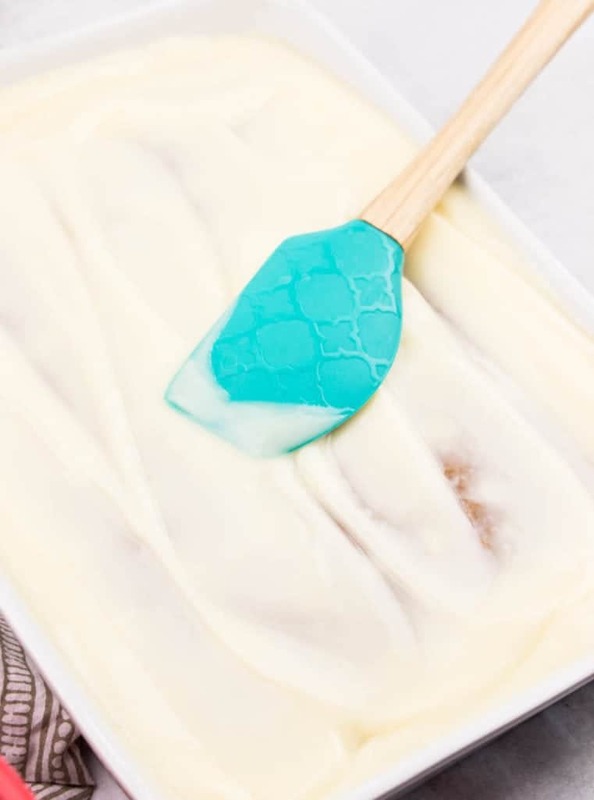 Then, with a wooden spoon handle, a spatula handle, or some other similarly-sized object, begin poking holes in the cake. You want the holes to be BIG so that the pudding has plenty of room to get down in there. Be sure to poke right down to the bottom of the cake. I usually let the pudding sit for just a minute so it isn't so liquid-y. But you want it to still be easily pourable. Spread it all out and using the back of the spoon, gently push pudding down into the holes. 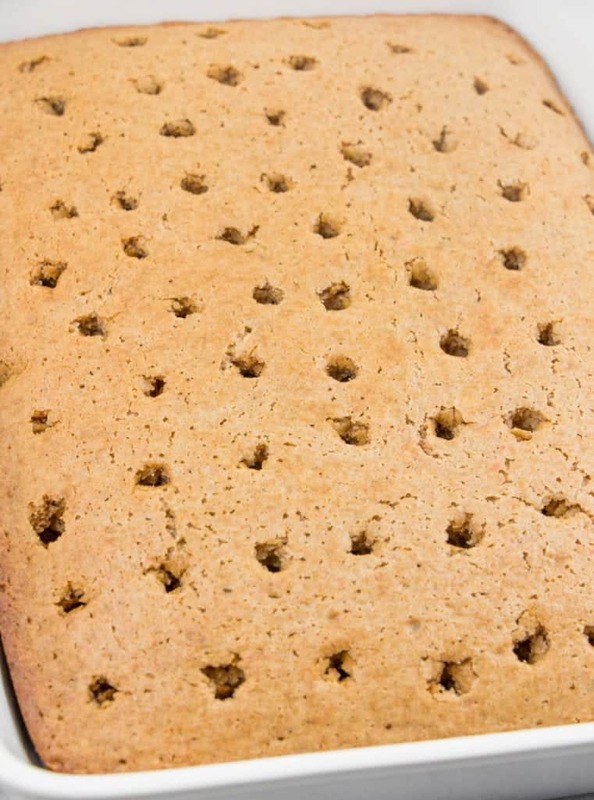 Sprinkle crushed graham crackers onto the top of the cake. You can do this part immediately before serving the cake if you like. This will ensure the crackers are crunchy when you serve it. Keep cake refrigerated. This cake gets even better the day after it is made. So it makes for a perfect cake to make the day before you actually need it. Love all of your poke cakes, and this carrot cake version looks so good, especially since I haven't had breakfast, Yum! This one looks delish!! 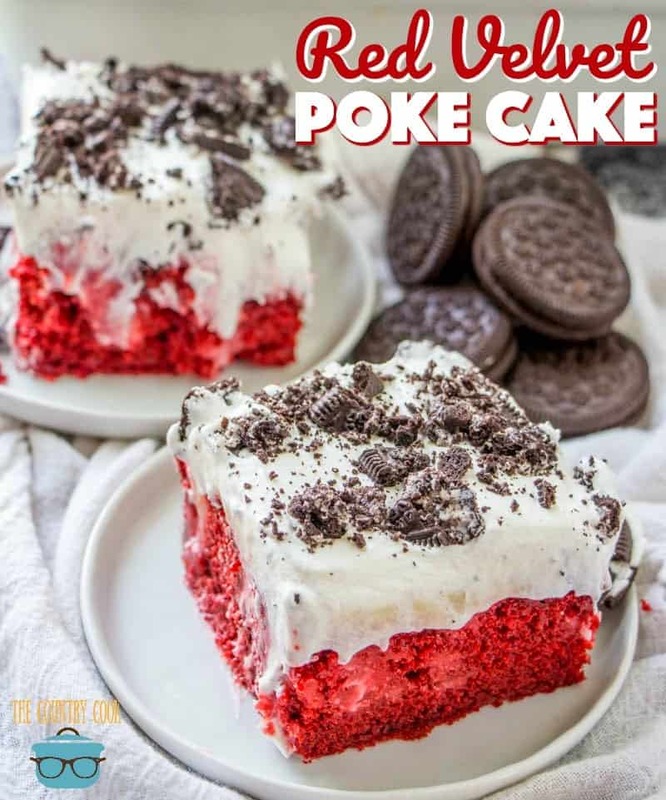 I'm a new poke cake fan, and I would love to try out this recipe sometime! Now I hve to decide which to make. Decisions, decisions. I love poke cakes too. Keep 'em coming. MMM this looks sooo good! I want!! 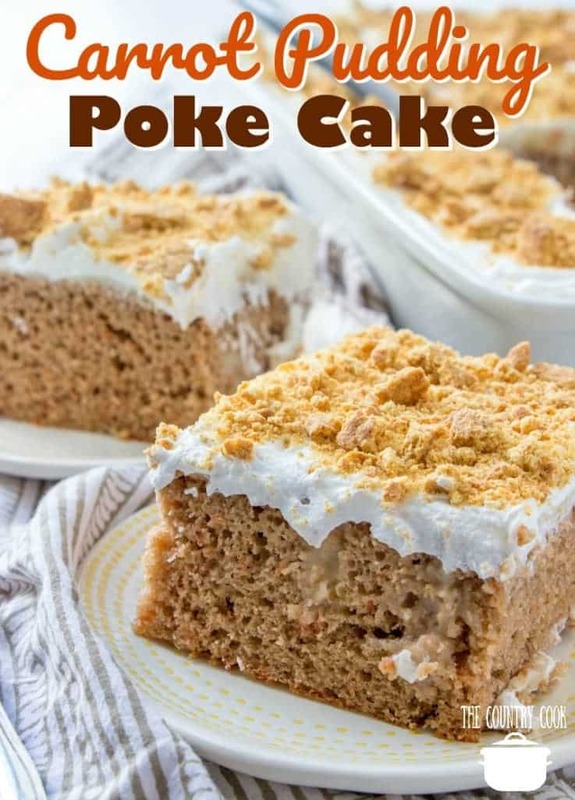 You have the best poke cake recipes of all times. Another good one for me to make. All of your recipes are to die for. I get really good compliments when I make your dishes. Thank you so very much for the sweet comments! I really hope y'all love this one!! Sweet! I do believe this just solved the issue of what I am bringing to Easter dinner! This is gonna be such a treat for everyone! Love your poke cakes! Your are the poke cake queen and you come up with the best combinations. They are so easy and everyone seems to love them! This one looks perfect for Easter/spring time! Yum, Brandie! This looks so delish!!! Happy Easter! I am surprised at how many different poke cakes you can come up with . I strain my brain attempting to think of a good combo and next thing I know YOU have a new one . I love them ….. Keep'em coming please. Great minds think alike! I was thinking about your poke cakes and decided to try a carrot cake one, then I get online and you have a recipe for one on here!!! Yours looks amazing 🙂 I added some extra carrots for flavor and moistness. I cooked 1 1/2 cups frozen crinkle carrots with a little water and cinnamon, then puree'd them in my ninja. Let them cool and mix with 1 tsp. baking soda. I used the Sugar Free/Fat Free Cheesecake instant pudding. I also lowered the baking temp to 325 and baked for 36 minutes. I made a poke cake over the weekend and it did not turn out as well as yours. I need some advice! The holes I poked were not as clean as yours. The cake seemed to spring back into the vacated hole when I lifted the spoon!! I think maybe I did not wait enough for it to cool? Help please! Brandie—thanks for the shout out! Your version of a carrot cake poke cake looks even better (and more delish) than the one I sent you. Can't wait to try it! Thanks for all you do, and I wish you a very happy Mother's Day—hope it is fabulous! I love your poke cakes. I wanted to share what I have been doing when I make the poke cakes for just the two of us empty nesters. I make the cake in an eight or nine inch square and then use the remainder for cupcakes. I then half the icing ingredients for the smaller cake and freeze the cupcakes. The smaller cake is consummed before it gets soggy with just the two of us. I am going to mix cinnamon in the cool whip….yum! Love these recipes!! Easy, delicious, what more can one ask!! Even us wanna be bakers can be successful!!! Thank you!! You are awesome! Thank you for sharing your recipes, I really appreciate them, the fabulous pics and YOU! I made this for Easter Sunday lunch and it was a big hit. 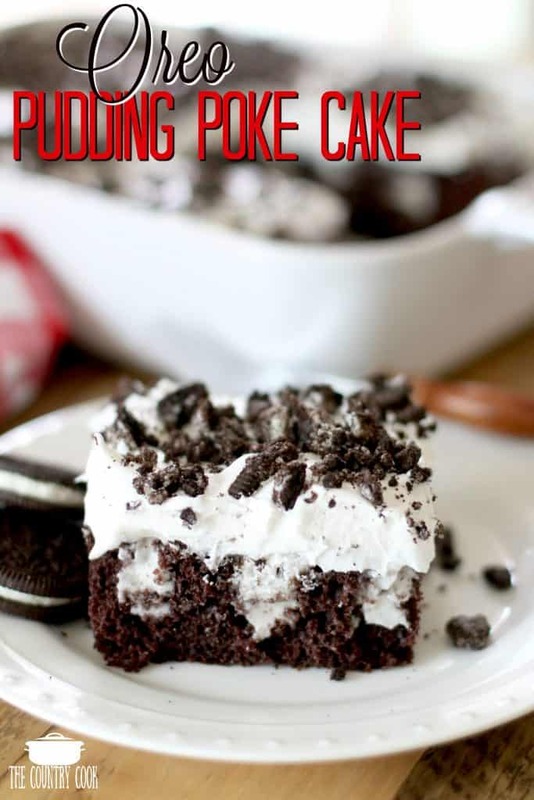 I've made several of your poke cake recipes and love them! Thanks for sharing. I made this and it was a huge hit! Just made this cake for Easter and everyone loved it.It was so easy to make!The pudding does set up pretty fast so you can’t wait too long to pour it in the holes.I didn’t have Graham crackers,so I used chopped walnuts instead.Will make this again!